Why was this cockpit much more complex than any other modern day aircraft or a fighter jet? It looks to have many more buttons and controls, and very small (interesting) screens. Also, its steering was much different than you would see in any other aircraft. Firstly, as others have noted, you imply Concorde was modern when you compare it with "other modern" aircraft. OK, it was a "jet-age" aircraft, but it wasn't a 21st Century design. it was designed before "glass cockpits" were possible, in the 1960s. 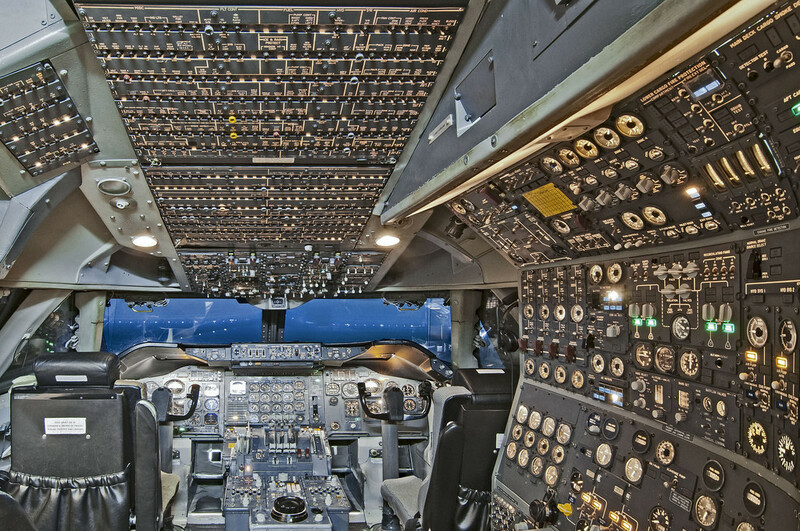 There were no real multifunctional displays then, so there had to be a switch or dial for every possible action and every possible parameter the pilots might need to know about. 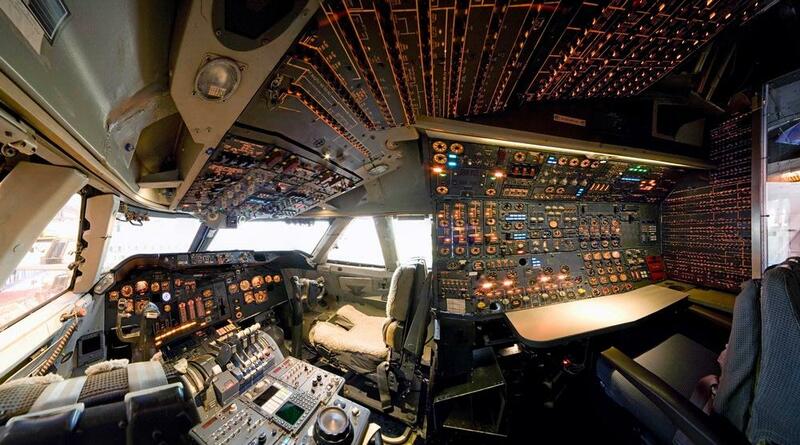 The main difference is probably the flight engineer's panel on the right. Modern aircraft have two pilots in the cockpit and no flight engineer. I imagine that increased automation in engine controls mean that the engine management by the crew is much simpler and requires fewer controls and dials. These are now typically located in the center of the main instrument panel above the thrust levers etc. 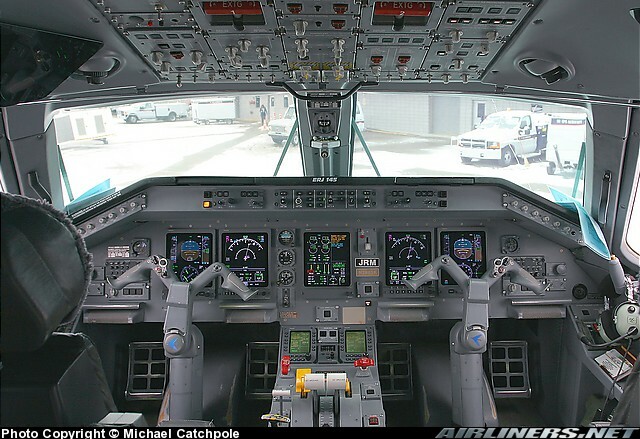 A lot of the controls and instruments are duplicated in a two-pilot cockpit. In a fighter jet, you only see one set of instruments and controls. Also a one-engine plane will have a quarter the engine controls of a four engine plane. Fighters probably lack an APU. Although fighters have additional switches etc for armaments, airliners have additional switches etc for passenger related facilities (seatbelt lights, a/c? etc), security (cockpit door), cabin-crew comms and so on. They also may have more fuel tanks and maybe more means to move fuel around in flight to trim the aircraft. Modern glass cockpits just hide all that complexity, just imagine you could rotate 90% of what you see out of view. There are no screens at all. There is a colourful moderately-complex artificial horizon instrument which also shows aircraft attitude and a few other things. The visual part is essentially mechanical rather than created by a light-emitting digital display. Also, its steering was much different than you would see in any other aircraft. The shape of the control yoke may be slightly unusual but it operates the same was as any more common yoke design. You push it forward and back to control the pitch using the elevator (or elevons) and you rotate the top part left or right to control roll using ailerons (or equivalent control surfaces). There are buttons on the had grips to control a few functions. I think the shape was partly to make it easier to get in and out of the seat. Now compare the pictures. You will notice the same level of complexity in the cockpits. Sure there will be differences if you make an in-depth research, but bottom line is that analogue cockpits look "cluttered" compared to the modern and "sleek" glass cockpits. The cockpit is much more complex than any other modern day aircraft or a fighter jet because it is an Analogue cockpit. 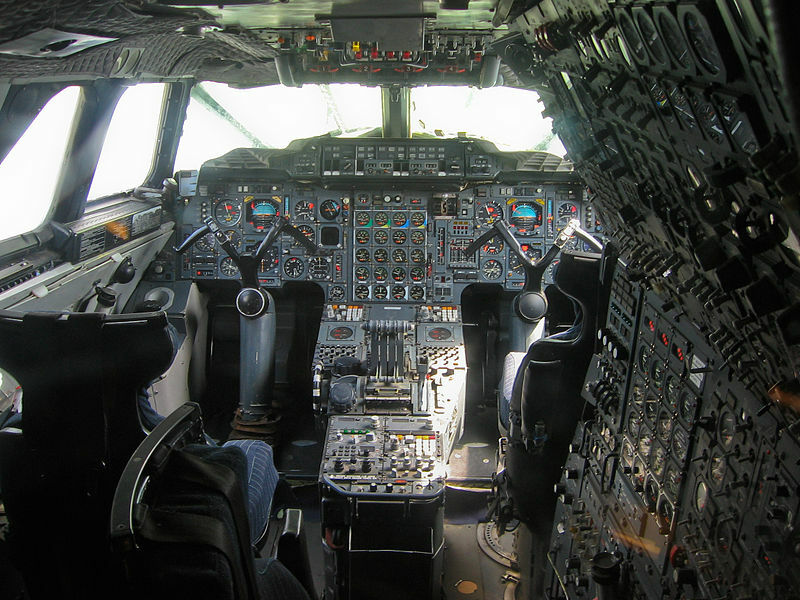 Concorde was designed in the 60's and at that point of time the technology was not simply advanced enough to have LCD screens in the cockpit, and neither capacitive/resistive touchscreens were around the block. Hence this left switches/levers as the only options with the designers and that is why you see a lot of these in the cockpit. Additionally, Concorde had a lot of additional controls like the Droop Nose and the Afterburners for supersonic flight. Such additional controls would need more switches, and increase the complexity of the cabin. 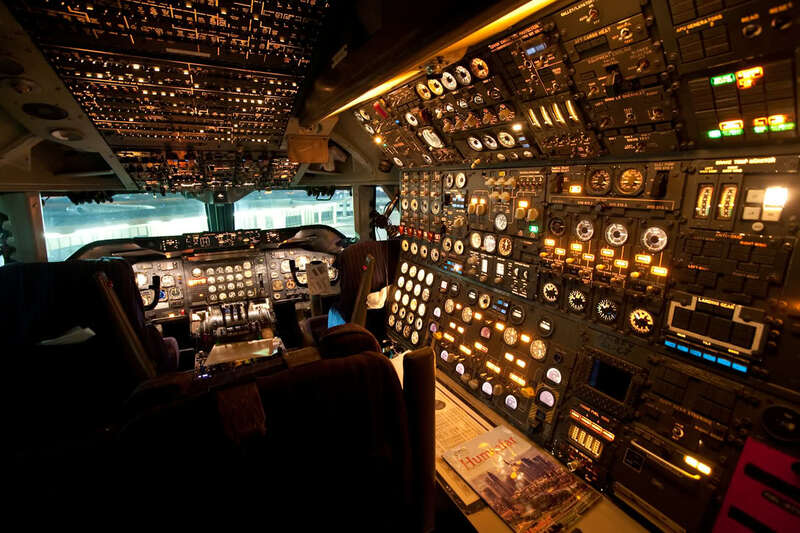 Also, since the on board computers were not very advanced at that point of time (even though Concorde had one of the most intelligent computers at the time of its inception), hence the flight engineer and the cabin crew had to monitor and control a lot of systems manually, and since the cabin was very cramped (as can be seen in the image), this gave a very claustrophobic and complex look to the cabin. Concorde was different from other aircraft simply because its design origin lies in the technology of the 50s and 60s and it was designed to do something very different from subsonic aircraft. Namely to fly 100 plus people in comfort above mach 2. Some extras required to achieve this included: 11 fuel tanks with controls to ship fuel around to trim the aircraft in flight, with someone to manage that task. A skin and window cooling system because it got hot and without it would burn anyone touching a window. Engine air intake controls because engines cannot accept air at mach 2. Adjustable jet pipes to optimise engine performance. The droop nose because it needed to be streamlined in cruise but the pilots needed to view the runway on landing and taxiing. Reheat controls for oomph. And I guess a few other things as well. So you can't really compare Concorde with any other current subsonic aircraft. We need a new modern supersonic equivalent with which to compare. The flight deck will obviously have a more modern look but the the physics of supersonic flight still need to be managed. Not the answer you're looking for? 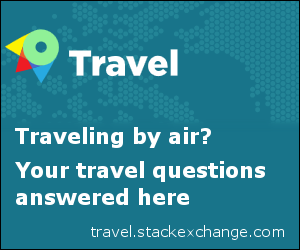 Browse other questions tagged aircraft-design cockpit concorde or ask your own question. Why don't cockpit windows suffer pressure leaks? Can a few random interaction with cockpit controls result in a crash? Why are fighter pilots seated and not reclined? Why does the Dassault Falcon 7X's cockpit have ashtrays? Heaviest Boeing vs Airbus aircraft: Why large (150 ton) difference in Weights? Why was Concorde never sold as a private business jet?